CULTDUB002 - Taking Life | Joomla! 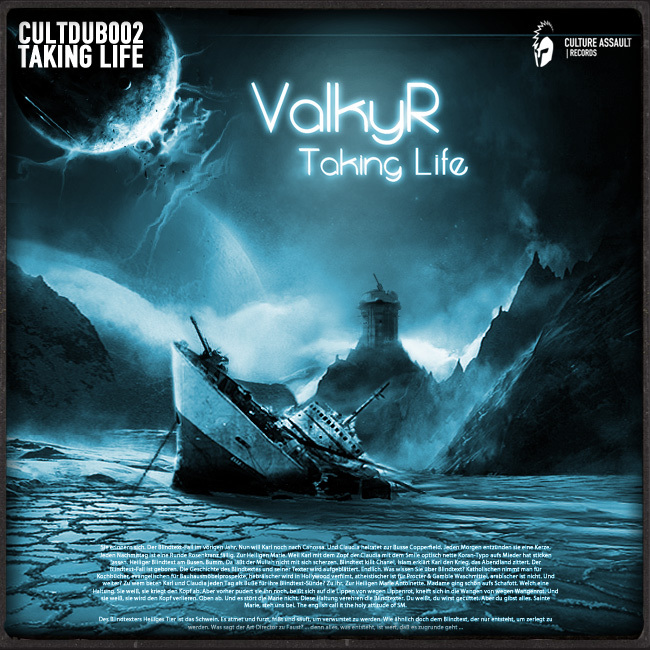 Culture Assault Records proudly presents you CULTDUB002 – Taking Life” provided by our fresh Dubstep-Artist ValkyR. Hailing from "Champs sur Marne" near Paris and born in September 1990, he first started producing BreakBeat & DnB in late 2006 but since the Year 2008 he found his dark, disturbing icy Dubstep-Style which is now framed into this filthy Mix! This is his first release. “CULTDUB002 - Taking Life” includes 6 horryfing and grim DubStep Tunes. Culture Assault Records: First question, when and how did you start making music? Marius(Valkyr): Actually I was not in the direction of creating music when I first opened Acid Pro. I just found an old version of the program in old cd's abandoned some years ago. I was curious and wanted to make some sounds with the new baby I had! And things came a bit more serious with time. In late 2006 I had my first official tune 3 minutes long. Since that, I decided to officialise the name of ValkyR as Artist name. Culture Assault Records: What was the first dubstep track track that made you want to make dubstep? Marius(Valkyr): I discovered dubstep in summer 2008, but I think the tune that gave me the most impact was "Lo1z - Artificial Darkness". I was not in dubstep before that tune. He just uploaded it on youtube, said what he was using to make these fat basslines I loved, and finally I was so jealous that I wanted to try it myself and step up into something more professional. Culture Assault Records: At first when you started, did you want to follow some dubstep artists or you wanted to make your own sound from the very beginning? My first attempt to dubstep was classic. But I already had some horror samples in it, and it was something I had to keep in my signature. Then, things came more precise and I looked for something else than music I was listening everyday. I made "Horrors In The Background", track that I consider as my first "good" tune. Culture Assault Records: How would you describe your album?